‘Warrior caste’: Is a public disconnect hurting military recruiting efforts? Military leaders are looking for the best ways to recruit the next generation of troops amid a growing divide between the military and civilians. About 80 percent of new military recruits come from families with a history of service, but that number is shrinking. According to the Defense Department, 15 percent of young adults have a parent who served, a drop from 40 percent in 1995. There’s also a declining rate of family members who served who are recommending joining the military to their children. In the late 1990s, more than 80 percent of service members recommended serving, according to research by Booz Allen Hamilton and Blue Star Families, a nonprofit organization that serves those in the military community. In 2017, only 40 percent of those serving recommended that path to their children. A panel of experts discussed these setbacks and how to address them at the Bipartisan Policy Center on Thursday. Air Force Secretary Heather Wilson, the event’s keynote speaker, said there’s not a lot of focus on how to develop and attract the next generation of great leaders. This also means, she said, that the burden of continuous combat operations has fallen on a relatively small number of people and families. A new commission created by Congress also launched on Thursday, which will focus on ways to increase military and civic service among American. The 11-member National Commission on Military, National and Public Service will travel the country in 2018 and 2019 to “ignite a national conversation around service and develop recommendations that will encourage and inspire all Americans, particularly young people, to serve,” according to a news release. Eleven commissioners will travel the country in 2018-19 to learn how to increase military and civic service. The Defense Department and various organization are also working on ways to educate people who don’t have ties to the military and to get them excited about signing up to serve. On Feb. 1, the Defense Department is launching the “This Is Your Military” initiative to inform the public on what military is doing today and how it affects civilians. “We want to showcase how the military is relevant to Americans’ lives on a daily basis,” said Amber Smith, the DoD’s deputy assistant to the secretary of defense for outreach. The initiative includes a video series to highlight service members’ stories and dispel myths about the military. Smith said most of Hollywood’s stories about the military focus on two extremes: larger-than-life individuals and veterans who are broken and can’t adjust to society. Smith said the initiative wants to share these stories so America can get to know this side of troops. “We want to articulate the message of what the military’s doing to a non-military audience and create interest for people who don’t necessarily care,” she said. To reach that broader audience, the Defense Department will work with media, nonprofits, educators, Hollywood, sports leagues and other organizations. Starting in February, each month will feature fresh content to show civilians what serving in the military is actually like. Follow @DoDOutreach and #KnowYourMil on Twitter, Facebook and Instagram to find out more about the initiative. Kathy Roth-Douquet, CEO of Blue Star Families and a military spouse, said civic education has somehow petered out in the United States. It’s up to those in the military community to tell their stories, she added. 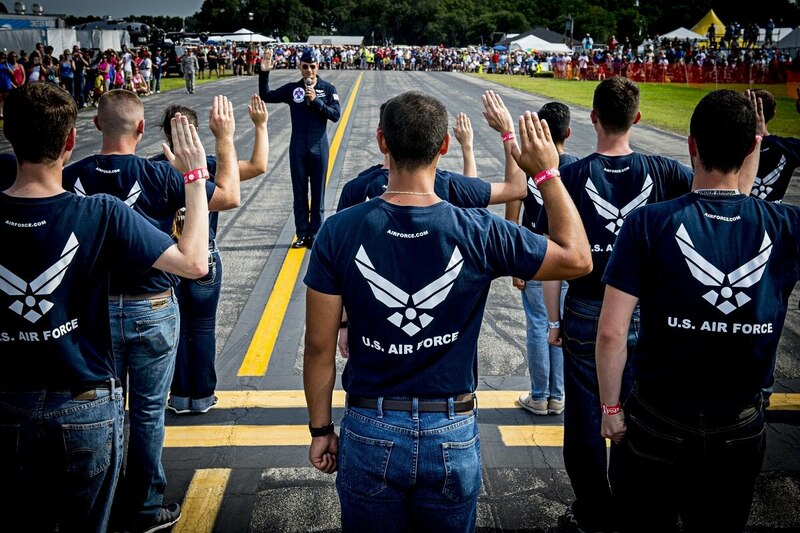 Air Force Secretary Wilson said the Air Force will continue to recruit from states that have a large pool of 18-year-olds, including California, Texas and Florida, but the service wants to attract people from other areas, too. Wilson said the Air Force added about 600 recruiters and will put them in regions that are underrepresented, including the northeastern part of the United States. Blue Star Families’ Roth-Douquet said one of her favorite recommendations is to have all 18-year-olds register for selective service. They would take the Armed Services Vocational Aptitude Battery to see what they would be good at in the military, and “it would tell them about jobs they probably didn’t know existed,” she said. It also would give the potential recruits a moment to picture themselves in the military, which could be enough to encourage them to join, she said. Even though there’s a higher percentage of women serving in the military than in previous years, the military wants that number to grow. “We’re trying to make clear how natural a fit women are in the Air Force,” Wilson said, adding that 20 percent of those serving in the Air Force are female. Wilson asked the audience to think about the most protective person in their lives. Wilson said there are all kinds of protectors in the Air Force, and the service needs to attract and develop them. “We also need to change some of the ways we do things,” she said, adding that some equipment still is designed for men.